Two years ago, I read and reviewed Vera Brittain’s collection of letters Letters from a Lost Generation. It was one of the saddest, most harrowing books I’ve ever read. After finishing it, I read Testament of Youth, Vera Brittain’s memoir, which was equally moving. Needless to say, I was interested in watching the movie Testament of Youth. Vera Brittain’s story is really one of the saddest imaginable. Not only did she loose her fiancé, but also her brother and their two closest friends. After the war, she met the writer Winifred Holtby – we see her very briefly in this movie – and they became very close friends until Holtby died at the age of thirty-seven. Besides being a testament to the friendships between Vera and her friends and brother, the books give great insight into the life of a nurse during WWI. Like the men, she joined up early and stayed a nurse until the end of the war. The movie takes a long time to show us the idyllic pre-war years. Vera has a close relationship with her brother, Edward, who introduces her to his friends Roland, later Vera’s fiancé, Victor and Geoffrey. It is 1914 and Vera, who at eighteen is the youngest, tells her parents she intends to go to Oxford. The parents are shocked and oppose her. They don’t want her to become a blue-stocking. and minimise her chances to find a husband. Thanks to her brother she’s allowed to go to the exams and is accepted. As happy as she is to be allowed a higher education, when the war breaks out and her brother, fiancé, and friends sing up, she becomes a nurse. The movie shows a few scenes of her as a nurse but it makes it look like she didn’t really do it for a very long time. Nor that she was moving from England to different front lines in France and Malta. It rather focusses on the death of her fiancé and her brother. We then get to see her briefly after the war and how she meets Winifred Holtby. It’s a very short scene as well. The movie tries to capture the mood of the era and manages more or less. I guess, the tone of my review, tells you that I was disappointed. The movie’s neither fish nor fowl. Not a real love story, nor the story of the friendships or her years as a nurse and not very insightful about the war as such. The director tried to cram to much into a short film. It would have been much better if this had been a mini-series. More moving, more realistic. The way it is, it’s not very successful. It’s not dreadful, it’s beautifully filmed, well acted but not very engaging and stays at the surface. This is possibly also due to the rather large cast. It’s impossible to care for so many people in an average length movie. You can watch it but you don’t have to. Read the books instead. They are some of the best books on WWI. 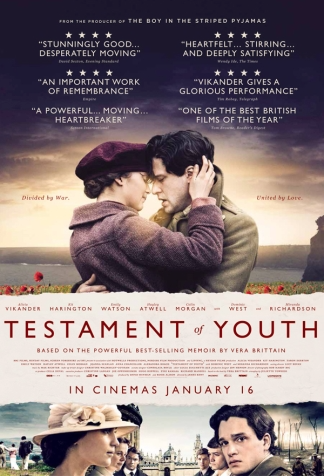 This entry was posted in Movie, Reviews, Trailer, True Story, Uncategorized, War Movie and tagged Movies, Movies based on books, Review, Testament of Youth, Vera Brittain, War Movies, WWI. Thanks for letting me know. I’ll see if I can find it. As you say the miniseries is better for some books, and I think it shows w/the older edition. I need to track it down. Thank again. The book is too rich for a movie.